The philosophical wisdom of the pre-Christian World survives, and lives on, and with us, will advance, and shape the coming eras with the help of earnest, dedicated students, which must be genuine and honest. This honesty includes dismantling the lies about antiquity, that has shielded our theologians for centuries. “Let it not be imagined that we bring this reproach to any who revere Jesus as God. Whatever the faith, if the worshipper be but sincere, it should be respected in his presence. If we do not accept Jesus as God, we revere him as a man. Such a feeling honors him more than if we were to attribute to him the powers and personality of the Supreme, and credit him at the same time with having played a useless comedy with mankind, as, after all, his mission proves scarcely less than a complete failure; 2,000 years have passed, and Christians do not reckon one-fifth part of the population of the globe, nor is Christianity likely to progress any better in the future. No, we aim but at strict justice, leaving all personality aside. We question those who, adoring neither Jesus, Pythagoras, nor Apollonius, yet recite the idle gossip of their contemporaries; those who in their books either maintain a prudent silence, or speak of “our Saviour” and “our Lord,” as though they believed any more in the made-up theological Christ, than in the fabulous Fo of China. There were no Atheists in those days of old; no disbelievers or materialists, in the modern sense of the word, as there were no bigoted detractors. 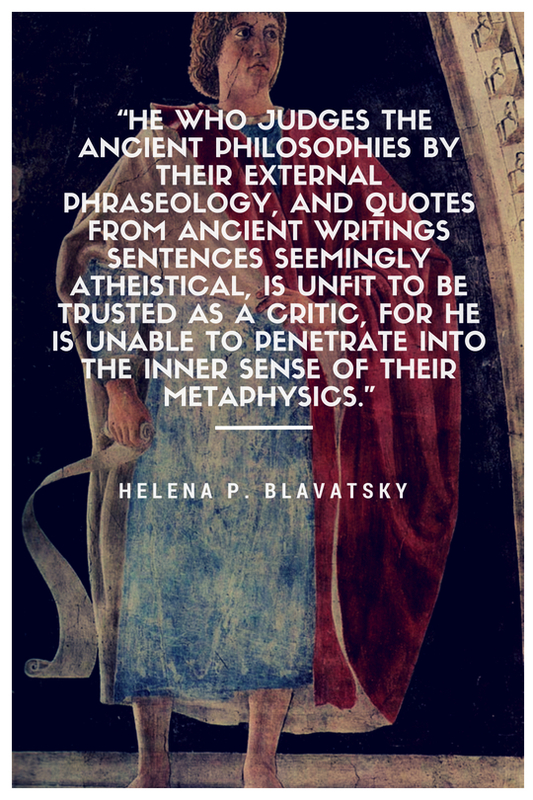 He who judges the ancient philosophies by their external phraseology, and quotes from ancient writings sentences seemingly atheistical, is unfit to be trusted as a critic, for he is unable to penetrate into the inner sense of their metaphysics. The views of Pyrrho, whose rationalism has become proverbial, can be interpreted only by the light of the oldest Hindu philosophy. From Manu down to the latest Swabhavika, its leading metaphysical feature ever was to proclaim the reality and supremacy of spirit, with a vehemence proportionate to the denial of the objective existence of our material world — passing phantom of temporary forms and beings. The numerous schools begotten by Kapila, reflect his philosophy no clearer than the doctrines left as a legacy to thinkers by Timon, Pyrrho’s “Prophet,” as Sextus Empiricus calls him. His views on the divine repose of the soul, his proud indifference to the opinion of his fellow men, his contempt for sophistry, reflect in an equal degree stray beams of the self-contemplation of the Gymnosophists and of the Buddhist Vaibhashika. Notwithstanding that he and his followers are termed, from their state of constant suspense, “skeptics,” “doubters,” inquirers, and ephectics, only because they postponed their final judgment on dilemmas, with which our modern philosophers prefer dealing, Alexander-like, by cutting the Gordian knot, and then declaring the dilemma a superstition, such men as Pyrrho cannot be pronounced atheists. No more can Kapila, or Giordano Bruno, or again Spinoza, who were also treated as atheists; nor yet, the great Hindu poet, philosopher, and dialectician, Veda-Vyasa, whose principle that all is illusion — save the Great Unknown and His direct essence — Pyrrho has adopted in full. These philosophical beliefs extended like a net-work over the whole pre-Christian world; and, surviving persecution and misrepresentations, form the corner-stone of every now existing religion outside Christianity. Next Next post: New York Times Profiles Tony Hovater: H.P. Blavatsky, an Anti-Semitic influence on Nazis?